In the last piece about mula bandha and its relationship to the pelvic floor muscles, I alluded to the muscle that might be most associated with uddiyana bandha. Well, here we are continuing down the path to try and bridge the subtle and gross of our bodies as best we can. Again, I should mention that the bandhas in particular are an area that I shy away from making too anatomical, as they are energetic components, not physical. After all, I consider myself a yogi first and an anatomist second. 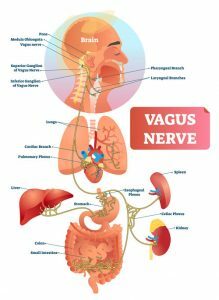 However, there are physical parts that can help us understand and relate to these more subtle aspects of our anatomy. For mula bandha it was the pelvic floor, for uddiyana… well, let’s talk about this for a minute. I often ask the question, how would you know if someone was engaging or using their bandhas? The answer in some form or fashion is that you see the results. You see the qualities created by mula and uddiyana bandha in the individual as they move and practice. What are the qualities? Mula is the root lock, which means one would observe a grounded quality to the asana being performed. Uddiyana bandha on the other hand means upward flying and is often observed as an overall ease and particularly a lightness in the yoga practice. The very famous floating aspect in advanced practitioners is a sign of bandha use and control. This is not to say that there is no muscular effort. There most definitely is. One must also have strength to make these movements happen, but to look effortless seems to require the use of the subtle aspects of our being. I know I’ve been keeping some of you in suspense about what physical part of the body is related to uddiyana, but some of you have probably guessed already. If you haven’t, it’s the psoas muscle. I’ve already written a short article on the psoas posted on the website. For our purposes today I want to tie the workings of mula and uddiyana together. There are three muscles that one could associate with the word psoas. First is the very small psoas minor muscle. Second, is the psoas major. 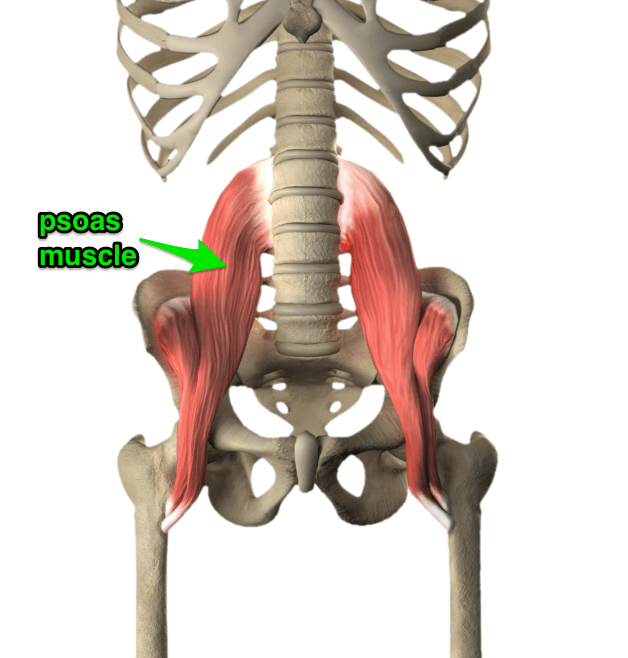 Third is the iliacus muscle, which, when combined with the psoas major, is known as the Iliopsoas. The psoas minor is somewhat disregarded as it a small muscle with a long tendon, meaning it’s not very powerful. It is the function of the iliopsoas (the combination of iliacus and psoas major) as the strongest hip flexor of the body that brings everyone’s attention to it. This movement of hip flexion is essential to us as humans, as it is what takes us forward in our daily life. It is the primary muscle for walking. Although you could simplify walking as flexing the femur so that one foot goes in front of the other, it’s certainly much more complex than that, and many other muscles are required to carry out this complicated and coordinated action. What we’re essentially doing is both controlling and moving our center of gravity forward in space. We’re balancing it on those two long sticks we call legs. Our physical center of gravity is near the top of our sacrum. It’s only slightly different for men and women, but not so much. As we transition into other types of movements, especially if you think of graceful dancers, or powerful changes in direction like football players, what we essentially do is control the center of gravity in our body. The psoas is perfectly positioned to make this happen. It is a two-sided muscle. Each side is a more or less tapered, tube-shaped piece of myofascia falling on either side of our center of gravity. What this means, is that it is going to be intrinsically linked with the control of this area of the body. When one jumps back, forward, or lifts up into a handstand they are essentially controlling their center of gravity in relation to their foundation, which in this case is the hands. I hate to over-simplify it, but uddiyana bandha is having a connection to one’s center physically and energetically. 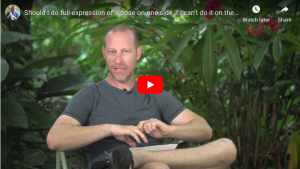 Awareness of the psoas, and attempted use of it, seems to trigger the resultant effect of uddiyana bandha – flying upward with control and lightness. At the very least, with attention to the psoas you should feel the beginnings of uddiyana bandha and can then refine it over time. There is of course one more element that should be discussed if you’re talking about bandha and that is breath. Without it there is no prana to control. Perhaps next time we’ll discuss that. If you can find your psoas and move from it, you should find strength and stability as well as control and lightness. I’ve put together a couple of resources for you here. Included is a video clip of me leading students through some surya namaskara with a psoas focus. It’s from a recent Yoga Anatomy workshop at Still Point Yoga London. On the same page is a great psoas article by Liz Koch, known for looking at so many of the aspects and effects of having awareness of this muscle. I also cover more on the physical and energetic aspects of uddiyana bandha on pages 155-158 (1st ed.) of my book Functional Anatomy of Yoga. And, if you’d like more from me… you can download just the psoas section of my YogAnatomy Volume 2 at the shop here. Hmmm… I was thinking the transverse abdominus played more of a role than the psoas. Any thoughts? Well, you’re thinking of the actual drawing in of the abdomen, which is definitely related to the way in which we stimulate uddhiyana bandha. This is the action if you will. However, what we’re really after is the affect of uddhiyana, the quality that it creates. So I offer psoas as the functional component of creating the qualities of uddhiyana bandha on the physical level. Such as lightness and control. I hope that helps. Surely as students and teachers we are looking for the action first – in order to get the effect? Anatomically speaking, are we not talking about a number of muscles which together stabilize the lower spine? Most students who have overindulged in food and have sat in chairs all their lives have lost the natural tone of the transverse abdominis, resulting in loss of essential support of the lower spine and the resulting epidemic of lower back pain. Uddiyana bandha is an important aspect of pranayama practice – Guruji used to press his fingers deep into the abdomen of the student, so that he/she would contract the transverse/oblique muscles and draw the internal organs towards the spine. He also guided us to press our fingers into the abdomen in Uttita Hasta Padangustasana and Prasarita Padottanasana B – again stimulating the contraction of the obliques and transverse abdominis. I would suggest, that in chaturanga, for instance, the transverse abdominis and obliques must play an equally if not more important role (not that we could do without any of these muscles). Maybe what you are talking about is the actions of jumping rather than asana, because in asana, an important function of the bandha and contraction of the obliques/transverse is on breathing as well and preventing hernia. You are absolutely right… no muscle every works alone or by itself. I say it in workshops all the time. This is especially true to stabilize the lower spine. The thrust of this post was begging the question of what anatomically creates the appearance as well experiences of lightness that we associate with uddiyana? 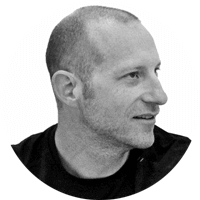 What helps us move in an effortless and efficient way through our practice? My answer to this aspect is psoas. I wouldn’t limit this to the “actions of jumping rather than asana”. Not at all. I also would not say that your transverse abdominus or other obliques and rectus abdominus are not important stabilizers. They actually help the psoas do its work. They are definitely needed and all work together. Having said all of that. Psoas is not your uddiyana. Transverse abdominus is not your uddiyana. Uddiyana is energetic and at best is stimulated by muscular contraction? Or is it the mental/mind that controls prana? Is it not more important to have a clear and strong mental focus or Intention of activating these energetic components? I would suggest that the psoas helps bridge this gap between subtle and gross more effectively than the abdominals. I find it to be a better mental hook of sorts that gets people headed in the right direction, a place of focus. Which leads me to suggest that INTENTION comes even before action… through intention and action, yes we get an effect. 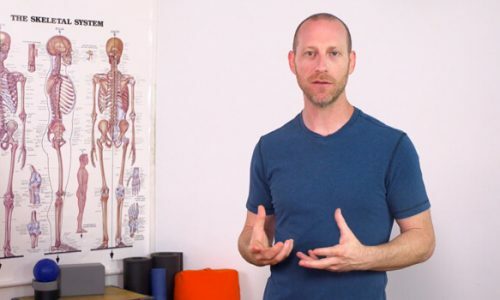 I have put people’s intention on moving from their psoas hundreds of times now. Let them see images of it. Help them to feel their own and then hold it as an intention of moving from that place through a few sun salutations. Yes, back to movmement… and those that do feel a difference in those sun salutations all report similar experiences from a change in intention, which creates an action and an effect. That sensation can be carried into the static aspect of other asana as well. The overall uddiyana conversation is much bigger and broader than the psoas. I wasn’t trying to suggest that the psoas was the be all end all of uddiyana or suggest that no other muscles might be used. Without doubt, the bandhas are bigger than one muscle. The psoas certainly plays a major role in the deep core muscle network and probably is a big component of the mula-uddiyana bandha complex. But I agree with the other responses that uddiyana bandha is more about the transverse abdominus than the psoas. I just don’t see a strong connection between the psoas and uddyana bandha, in theory or practice. In addition, I don’t agree with the sentiment that the bandhas are somehow more energetic than physical, or not even physical at all as you suggest. Whatever line is drawn between those two categories is artificial and subject to individual perception. It’s ok if you think that uddiyana is more about transverse. Certainly it is the transverse abdominus that draws the abdomen in, which is how we physically apply uddiyana bandha. In that sense, it’s the most direct link. However, I don’t think that transverse abdominus has the ability to make us float back and control movements at the hip joint. It would certainly serve a stabilizing function, but that’s it. Can you be more specific about your theory regarding uddiyana being more about transverse? That is, if it is something more than we use that muscle to draw our stomach in. Regarding bandhas being more energetic. The bandhas are both. After all, the title of the article is Uddiyana anatomically speaking. They are literally not physical, by literal I mean, philosophically from a yogic point of view and how they are spoken about in ancient texts. However, if we are talking about them in relation to movement and asana, then we are talking about functional movement. Hi Davis, thanks for your response! To be more specific, Uddiyana Bandha is literally, “flying up”. It is a lifting, drawing up from mulabandha, and shooting upward to the breastbone. It is very physical indeed, and the energetic component is inseparable from the physical component. These distinctions, energetic & physical are but different colors on the spectrums of sensorial experience and of neurobiological events. That lifting, or rising, is the primary component of Uddiyana Bandha and it is coming from the actions of the TVA. Of course, it is not limited to one muscle. I’m not sure what the actions of flexing the hips or floating back have to do with Uddiyana. Those are physical compound movements that include the use of Uddiyana Bandha in order to move our center of gravity downward. The psoas does have a very important role here and that is to stabilize the region of the pelvis, among other actions. The psoas, along with the illiacus and the gluteus mediums and some other muscles, provides the framework. But it is the TVA that does the lifting, and it is the lifting that is Uddiyana. I can only speak from experience. With Uddiyana Bandha there is a physical lifting, and an energetic lifting. But these feelings run into each other, they are not separate at all. Ultimately there is no distinction between physical and energetic. And so it is with the bandhas. Well said Nathan. Of course, I agree, it’s all merged, but it is helpful to separate things for the purpose of discussion and understanding. As long as we bring it back together at some point. For anyone reading Nathan’s comment… TVA is an abbreviated way of saying Transverse abdominus.